NASA Earth Observatory images by Jesse Allen, using VIIRS data from the Suomi National Polar-orbiting Partnership. 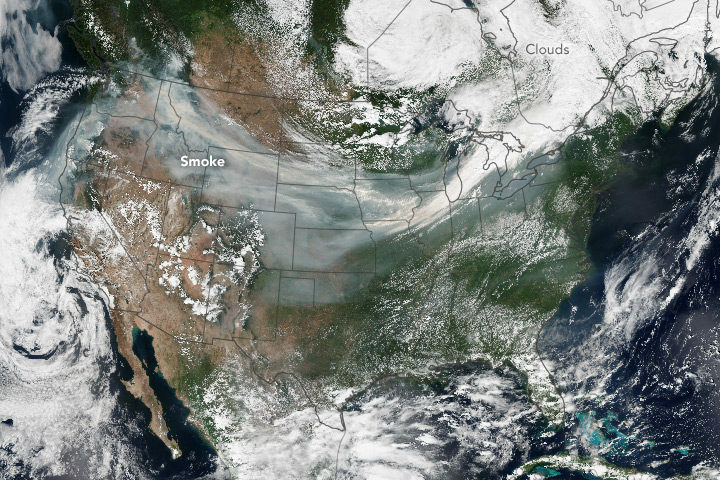 You have probably heard or read that it has been rather smoky out West this year. Dozens of large wildfires have raged through forests in British Columbia, Alberta, Washington, Oregon, Idaho, California, and other states this fire season. 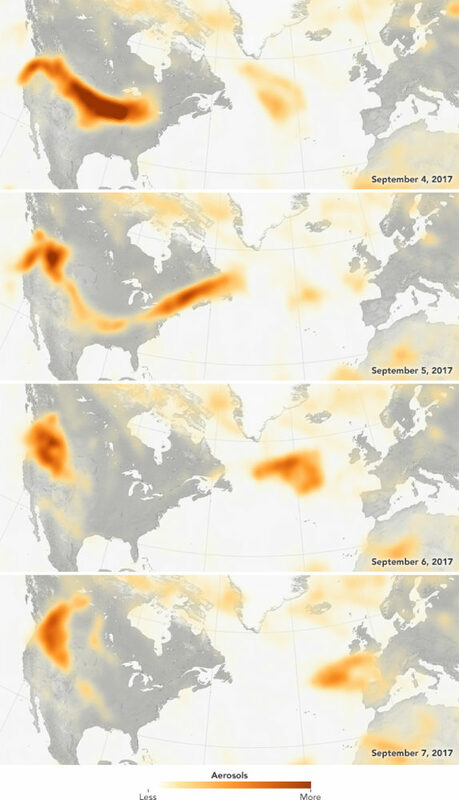 Intense blazes are lofting up so much smoke that huge plumes have been blowing across the country—and even turning up in Europe. We checked with a few scientists who specialize in studying wildfires for an update on what is going on. EO: How does this fire season compare to past years? The western fire season has been quite active this year. British Columbia has surpassed its greatest burned area in the modern era. While its unlikely that this season will be record-breaking in the western U.S., it is above normal relative to the past decade, which has seen abundant fire activity. EO: Is climate change exacerbating these fires? EO: Are bark beetles making these fires worse? EO: If there was one thing you wished Americans understood about wildfires in the West, what would it be? NASA Earth Observatory images by Jesse Allen and Jeff Schmaltz, using Suomi NPP OMPS data provided courtesy of Colin Seftor (SSAI). This entry was posted on Tuesday, October 10th, 2017 at 10:51 am and is filed under Natural Hazards, Roundtable. You can follow any responses to this entry through the RSS 2.0 feed. Both comments and pings are currently closed.